Overseas Indians, numbering over twenty-five million, have spread right across the globe and have made their mark in every walk of life - trade, industry, politics, academia and arts. They have played an enormous role in elevating India's image in the world. Indeed, in many cases, their impact has transcended national boundaries and has been truly global. The publishers of "The Indian" magazine, based in Hong Kong, have identified 100 people out of this vast population and released the second edition of a book entitled "100 Global Indians" which has three sections: The Leading Luminaries (30), The Entrepreneurs (40) and The Achievers (30). The criteria used to identify the "100 Global Indians" were based on a set of objectives not overwhelmingly dependent on success in the business world alone. "We carefully studied and weighed the track record of community service rendered by each biography. The overriding consideration has been the contribution they have made to enriching life in the community and the country they live in and how their role is seen by society at large" said K. Sital, Publisher of "The Indian" Magazine, and Editor of "100 Global Indians". "Given that there are over 25 million people of Indian origin living outside India and that this number is steadily growing, selecting 100 Global Indians is not an easy task" Mr Sital said. Some of the other achievers included were: Amartya Sen (1998 Noble Prize winner for Economics), The Hon. Sir Anand Satyanand (Governor-General of New Zealand), Bobby Jindal (Governor of Louisiana), Dr Deepak Chopra (prolific writer of New Age books), Jhumpa Lahiri (the 2000 Pulitzer Prize for Fiction), M. Night Shyamalan (Hollywood Filmmaker), Sonal Shah (American Economist & Advisor to Barrack Obama), Sunita Williams (Astronaut), and Dr Thomas Abraham (ex Chairman of Global Organization of Person of Indian Origin - GOPIO). Dr Magesan is one of only a handful of non-political personalities included in the list. It is indeed an achievement for Dr Magesan, who was born and raised in a small village in the Nilgiri Hills, South India. He comes from Badaga community, similar to Maori community. Guna Magesan came to New Zealand about 20 years ago for his PhD degree at Massey University. After completion, he worked for three Crown Research Institutes at different times in Palmerston North, Hamilton and Rotorua. Along with his science work, Dr Magesan also made enormous contributions to the various communities he has lived in since his arrival to New Zealand. 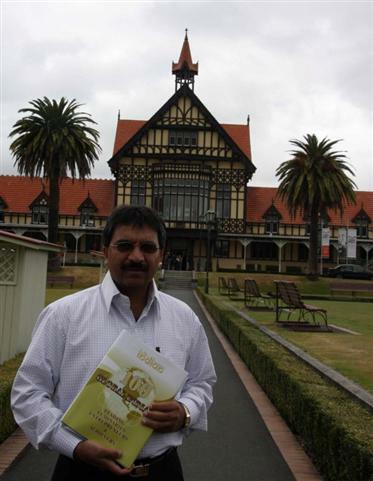 A leading figure in the Hindu Council of New Zealand, his drivers are inter-cultural understanding, youth development and promoting Indian culture and heritage to wider community. In Rotorua, Dr Magesan is renowned for his work on community festivals such as Deepawali, Global Fest and the recent new addition to the community calendar, Holi or Festival of colors. Through each of these, as well as embracing and educating the community, Dr Magesan has helped develop strong Hindu-Maori relations. Dr Magesan humbly acknowledges that there are many other people who share the credit in his achievements. "Without the support and encouragement from my family, members of our community and research organisations, I am not sure I could have achieved what I have" Dr Magesan said. "Blessings from the Elders and support from the committee members definitely had an influence" he added. Dr Magesan aims to combine science and community work, especially with Maori people. For example, taking practical science to Marae-based groups, promoting alternative farming systems to some of the marginal lands owned by Maori Land Trusts, and sharing knowledge with developing countries. "I have a passion for both scientific research and community wellbeing" said Dr Magesan. "My ideal job would be to combine both, especially with indigenous people." He suggested that such work could start here in Rotorua, and let Rotorua community become a role model for others. 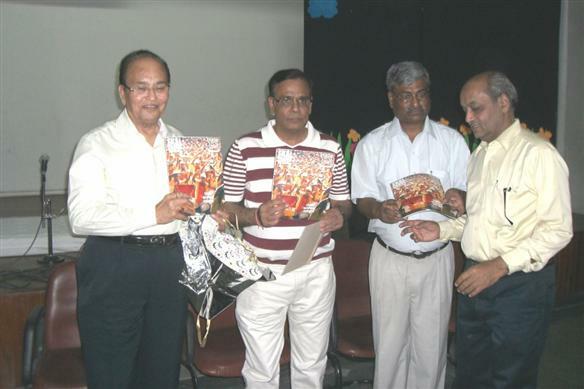 "Ekal Prayas", a bimonthly and a bilingual magazine was launched by Sri Kashi Nath Mimani, a well known Chartered Accountant, former Chairman of PHD Chamber of Commerce & Industry and Chairman of Ekal Vidyalya Foundation of India. The launch was done on 21st March 2010 at New Delhi in a function of Friends of Tribals Society which was organized to welcome Nav Samvatsar 2067. On this occasion Sri Mimani appreciated the efforts and blessed the team of "Ekal Prayas". He was confident that the magazine shall be able to motivate the people who are servicing the society as their mission and making all efforts to make it a good place to live in. The function was followed by a Kavi Sammelan in which noted poets Sri Gajendra Solanki, Sri Rajesh Chetan, Dr. Sunil Jogi, Sri Bangur and Dr. H.K Mittal enthralled and motivated the audience. Sri Ajay Singh, Editor of "Ekal Prayas" informed that the aim of the magazine is to keep the stakeholders, opinion leaders, policy makers and professionals informed about the development and progress of rural and tribal areas across the country. Commander (Retd.) Veerendra Jaitley proposed a vote of thanks to all. 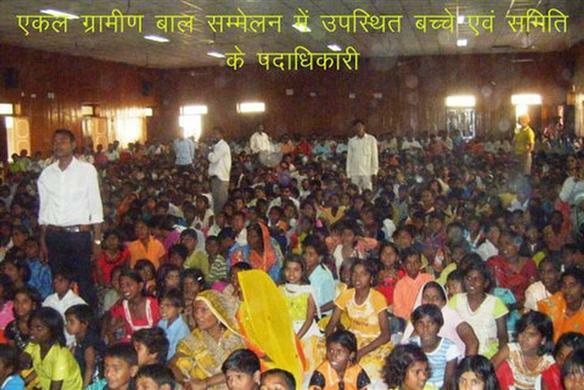 Ekal Gramin Bal Sammelan was organized with great enthusiasm in Varanasi on 7th March, 2010. Among the prominent personalities present were Shankeracharya Sri Jayendra Saraswati, Sri Harish Chandra Srivastava, former Finance Minister of U.P., Sri Ajay Singh, a leading businessman and Sri Lallan Sharma, Kendriya Jagaran Prabhari. 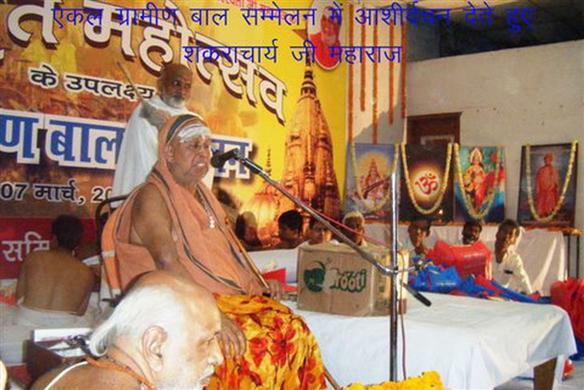 Sri Jayendra Saraswati delivered a very impressive speech on this occasion. In his speech he appreciated Ekal volunteers for the onerous task being undertaken by them. 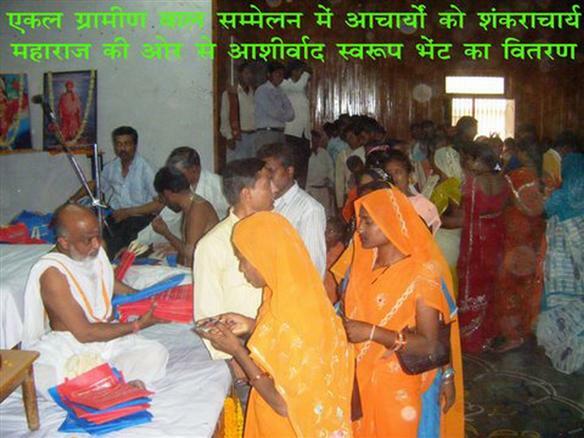 He distributed teaching material and costume to the teachers and students. A grand cultural programme was organized on 18th January, 2010 in Khandwa Anchal to celebrate the Sankranti festival with traditional fervor. 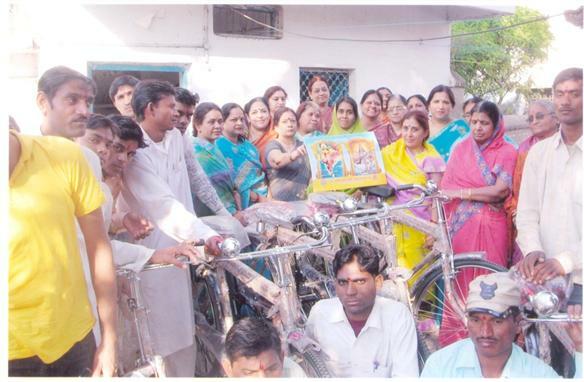 After ‘Tilak' ceremony, the Mahila Samiti of Khandwa distributed bicycles to 15 full time workers. The aim was to make the local trips of the workers easier and convenient. Many prominent persons including Sri Shyam Das Shah, President Samanvaya Samiti, Sri Bharatiji Jahawar and Incharge Mahila Samity, Smt. Amita Chauhan were present on the occasion. 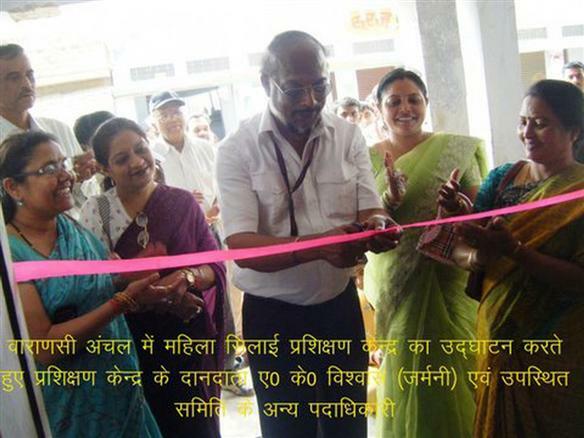 A Silai Prashikshan Kendra for women in Varanasi Anchal of Kashi Kshetra was inaugurated on 7th March, 2010 by its donor Sri A.K. Vishwas from Germany. Many office bearers of the Samiti were also present on this occasion. Children of ekal schools presented attractive cultural programmes. The Organizing Secretary of Kashi Kshetra, Sri Sant Lal Kesari delivered an impressive speech. Dr. Sunita, Incharge Mahila Samiti of Kashi Kshetra, was also present in the programme. FTS Chapter Nagpur invited Smt. Manjushree, National Org. Sec. of FTS and Sri S.N. Loya, National V.P. of FTS to take COC so that the newly formed chapter's core team should be got familiarized with the Ekal System and rules & regulations of the FTS chapters. 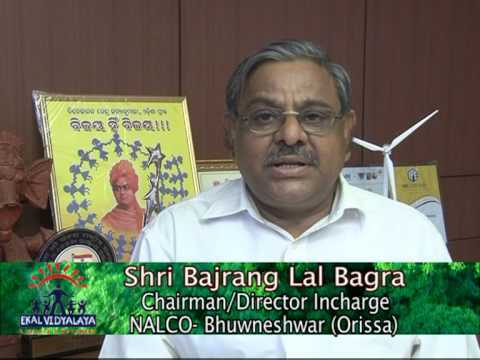 "Chapters are not merely city based organizations but they are the live connecting centres upto villages which come under their perview. 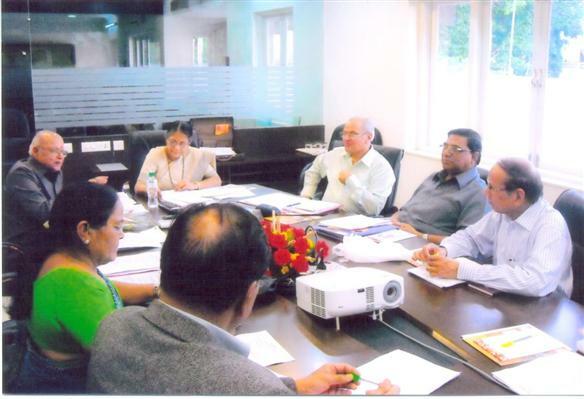 Hence, it is extremely important for the chapters to see that smooth functioning related to field, office administration and Nagar Sangathan, is well assured," held Smt. Manjushree in her speech. The Chapters orientation was well presented. It was quite comprehensive and convincing. 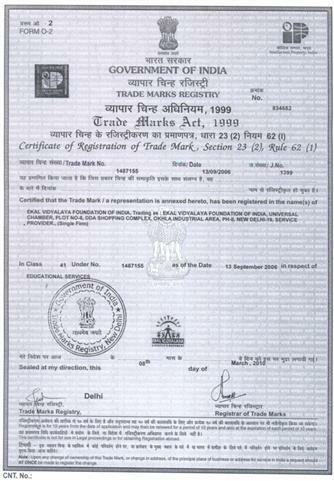 Our Trade Mark, the logo, has been registered in the name of Ekal Vidyalaya Foundation of India with the Registrar of Trade Marks, Delhi vide Registration No.1487155 and a certificate in respect of Trade Mark Registry has been issued in our favour. I had a wonderful and inspiring visit to the Ekal school in the small remote village of Pimpargane (Pop. 650; Tal. 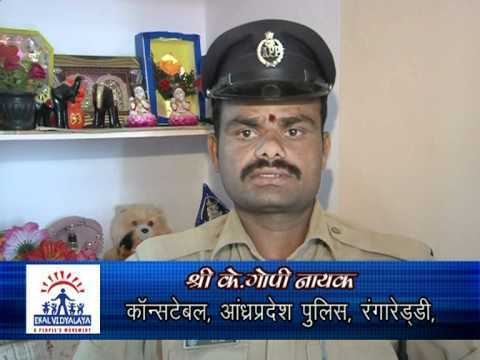 Ambegaon; Dist. Pune; in the Sahyadri Ghats). Anshuman ji contacted Sachin Shirde ji, who in turn arranged for Sri Achyuta Phatak to accompany me. He was a wonderful guide and companion throughout the trip, sharing his extensive experience with the whole operations. We left Pune at about 8:30AM on Monday March 8th, and reached the destination by about 12:30 PM. We then had a public meeting (well moderated by Sri Pandurang Phatak alongwith Achyut ji), followed by the childrens' class / demonstration (of great interest to me). We had good lunch, followed by a session with the Acharyas-in-training. We then spent some time at an ongoing wedding ceremony before starting on the return journey. On the way back we stopped at Ghodegaon (Tal. HQ) and interacted with in-charge (sankul-samity-pramukh) Sri Sanjay Madhav Nangre who shared many details of what is involved in running the programs at the Taluka level. I was very impressed by the motivation of all the people, especially the acharyas, and their hard work seems visible in the smiles and performance of the children I had the good fortune to see. There was also an atmosphere of happiness and discipline, where things appeared to be getting done quite efficiently too. I have taken some notes, videos & pictures, and will compile all & start sharing with as many people as I can, so that more people know of the real grassroots efforts Ekal is putting in. 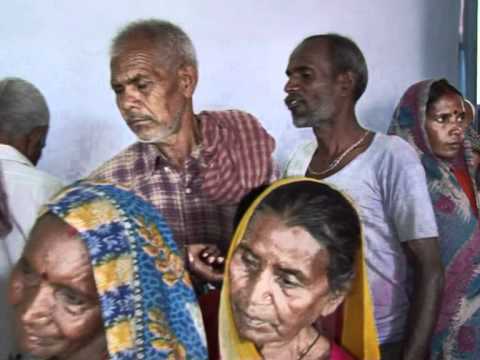 Indeed I will strongly attempt to get more and more people involved, both monetarily (donationwise) and time/effort wise in this wonderful seva. Thanks again for the opportunity of seeing things in a 'pratyaksha' way. Please convey sincere dhanyavaads to the Ekal people involved, including all the people of Pimpargane whose wonderful 'atithi satkar' is indeed an example of why our sanskriti is worth saving & propagating. On 18.03.2010 a team of 12 members from BLSP Ludhiana Chapter Mahila Samiti led by Smt. Samira Victor proceeded on Van Yatra to Burji and Kalurai villages under Firozpur Anchal. 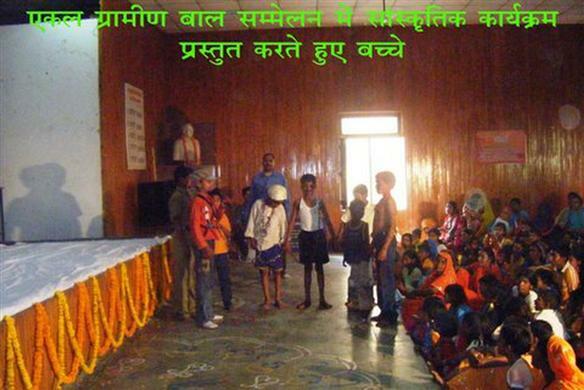 They were overwhelmed by the performance of the Ekal Students and painstaking efforts of the Karyakartas. They gifted a cricket kit, a volley ball and some stationery items to the students and a pair of suit to the Acharya and all the fulltime workers present over there. To get to know and experience Ekal Schools and programs directly there is no better substitute than undertaking a "Vana-Yatra". Vanayatra is typically a whole day car trip to see Ekal School in session with the opportunity to interact with the children,teachers ( Acharyas),villagers and Ekal workers (Karyakartas). In many villages the school teacher also serves as the basic health-care worker ( Arogya Sevak/Sevika) and the visitors will have the opportunity to get to know aspects of the Ekal Movement other than primary schools. Please note that Vanayatra is designed to help the visitor learn and experience Ekal Schools and programs first hand and does not involve the visitor formally teaching the students,which is based on the curriculum and defined methodology. 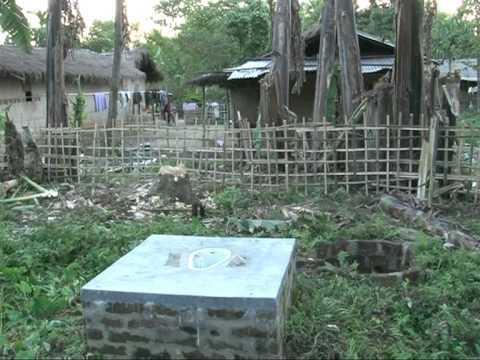 The distance and road conditions to reach Ekal School(s) in tribal/rural area can vary depending on the location. The car-ride could take one to four hours and a part or major portion of the trip could be on un-paved roads. The National or Local Coordinator could provide you the details based upon the location chosen. Generally Vanayatra can be arranged in any part of India where Ekal schools operate. Please note that Ekal Schools may be closed on Sundays or other days, as decided by the village committee, depending upon local festivals, weekly markets or other important occasions for the particular village community. The local coordinator will inform you of the advisability of the trip to a particular area on your desired days taking these variables into consideration. The cost of transportation will be borne by the visitors and ranges around Rs. 2000/- per day. As a rule, Vanayatra is a day trip and does not include overnight stay. However, if overnight stay is desired the visitor should discuss this with the coordinator ahead of time (see contact information below). Overnight stay can be arranged only if the desired location can meet comfort, food, health, sanitation, safety and other requirements of the visitors. Additional cost may be applicable for overnight trips. NRIs desirous of undertaking a Vanayatra need to call Mrs. Sangita Gupta, Secretary Ekal India at +91 9811076073 or alternatively Mr. Prasant Sahu at +91 9350255902 only after reaching India and at least 3days before the desired date of Vanayatra giving details of the number of visitors, area of the country where the trip is desired and their contact numbers in India. A local co-ordinator will then get in touch with you in a timely manner with further details. We encourage you, your family and friends to undertake a Vanayatra. It will truly be a positive and memorable experience of a life-time.